We're only a couple hours shy of the beginning of June and Washington, DC is already roughly the temperature of hell except probably more humid. 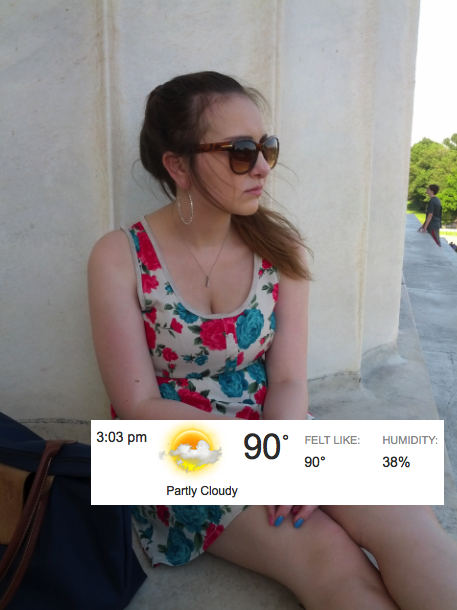 People who look cute living in DC in the summer are probably all 90lbs and have pixie cuts and no sweat glands. I have no other explanation for how it could be possibly. I was giving looks of pity to people all day long - people in pants, people in closed toed shoes, people with their hair down, basically anyone who wasn't exposing as much skin as you possibly can without getting arrested. Maybe not. But I should. I met up with my boyfriend for dinner after a day of walking around Dupont Circle. Apparently, he planned to get sandwiches and walk to the Mall for a picnic. It was a cute idea that I ruined because I was Snickers commercial level exhausted and hungry and I needed to sit down and drink something RIGHT NOW. My upper arms are like sequoia tree trunks wrapped in cottage cheese so I cover them with three quarter sleeves or cardigans in the summer. I'm pretty over that after one day in the DC humidity. Tourists can take pictures of my arm fat all day if they want because I'm about ready to burn anything I own that has sleeves. It's going to be all short shorts for my touching thighs and cellulite accenting dresses from here on out.